Photo courtesy of Boeing / Aerion Corp.
• Boeing announced a partnership with Aerion, a Reno, Nev.-based company pioneering next-generation supersonic aircraft. 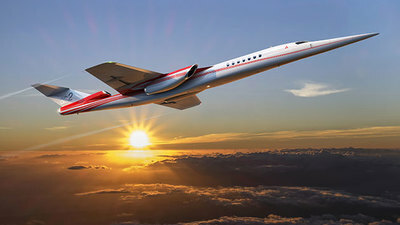 With the ability to fly up to 70 percent faster than today’s business jets, the AS2 will save approximately three hours on a transatlantic flight. Boeing NeXt is building the future of urban, regional and global mobility. We lead the company's efforts around global airspace integration to create a world in which autonomous and piloted air vehicles safely coexist. By uniting research and development efforts in autonomous flight and advanced propulsion across Boeing and our partners, Boeing NeXt is creating the transportation solutions of the future.